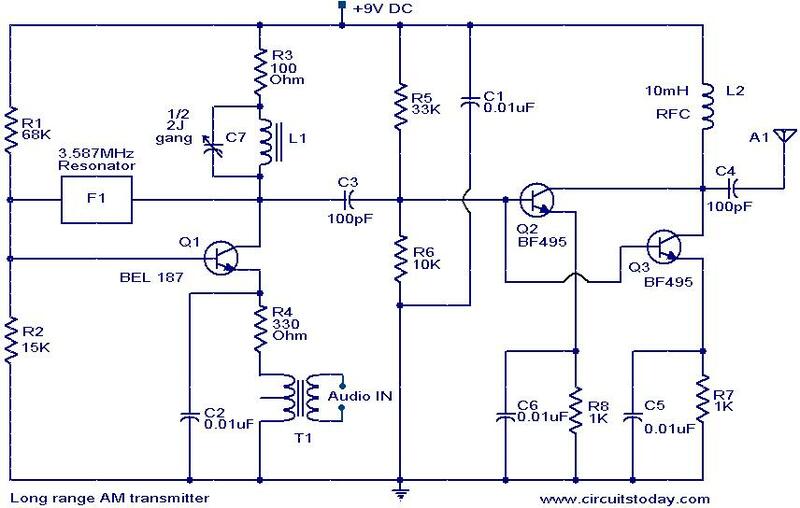 Here is the circuit diagram of an easy to build long range AM transmitter circuit based on three transistors.With correct tuning and a matching antenna, the transmitter can deliver signals up to a distance of 2 kilometers. The audio signal to be transmitted is given to the base of the transistor Q1 via the audio driver transformer T1.The modulated signal is developed at the collector of transistor Q1.The frequency of the transmitted signal can be tuned adjusting the gang condenser C7.The required amplification of the modulated signal is done by the two transistors Q2 and Q3.TheÂ twoÂ transistor amplifier stages are connected in parallel for obtaining maximum power. The signal to be transmitted is coupled to the antenna via the capacitor C4. The inductor L1 can be made by making 56 turns of 365 WG enameled copper wire on a 1 cm former. The transformer T1 can be a general purpose audio driver transformer seen in transistor radios. Inductor L2 can be a 10 mH general purpose radio frequency choke. Use a 1 meter insulated copper wire as antenna. Adjust the value of C7 for maximum range. Also, you can experiment with the length of antenna for maximum range. The resonator F1 used here is a two terminal type without a ground pin. If you are using a three terminal one, the ground pin must be connected to the circuitâ€™s ground. how to increase its range? what the value of L1 ? Why we can’t listen am signal in fm radio.,? I have made am transmitter but it’s n0t responsing in fm radio..
Can we make fm radio as receiver of am signal?? Seetharaman, i want to build this Am transmitter, but i want to be sure if it is working, or has anyone tried it before? Is this circuit really working? Hi Rex you can try this simple regenerative receiver. What is the maximum and minimum capacitance for the C7? I’m thinking of just building one. i am in final year ,i need a project to construct an electronics components . please help with a simple AM circuit . Hallo the following is a simple AM receiver you can change the number of turns in the coil to change its range of frequencies. You can start with a simple single layer wound 28SWG super enmelled copper wire wind 90 turns on 12mm dia wooden piece or plastic conduit piece. For above short wave frequency use 12 to 15 turns of 24 swg as above. use a PVC 2J gang for tuning the correct frequency. use a good antenna and earth for best performance. can anyone tell whether u ve got output? Hi Wayne 36SWG will be 32 AWG or 0.0076inch dia wire. Does anyone know if this circuit works?